We're Quantified. See the latest directly measured site data. We're small, but so is Target compared to Walmart. It's all about the type of people you attract and if they stick around. Half of all visitors qualify as regulars and nearly 30% of our audience returns for multiple visits each day. Put your brand before a young, fashion forward audience of early adopters. 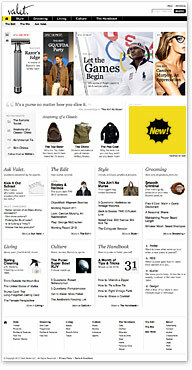 Homepage, Style, Grooming, Living, The Handbook, The Edit and Ask Valet. section fronts, subsection fronts and article pages. Expandable units accepted. Expansion must be user initiated, call to action must exist, unit should auto-retract when user mouses-off, can only expand left to a total size of 560x300. Prices vary based on targeted page, demand and client purchase volume. Get started advertising on Valet. E-mail us. Style, Grooming, Living, Personal Shopper, The Handbook, The Edit and Ask Valet. section fronts, subsection fronts and article pages. Expandable units accepted. Expansion must be user initiated, call to action must exist, unit should auto-retract when user mouses-off, can only expand down to a total size of 728x400. Valet. would be happy to dream up custom solutions that get your message across in new and innovate ways. To inquire about series sponsorships, custom content, email newsletters, interstitials, app advertising or other forms, please e-mail us.